There was a time when I was not aware of any kind of chutney's except Coconut Chutney. Now I just think which chutney should I prepare as a side dish which goes well with my breakfast. Actually I was introduced to this chutney fair by my mother-in-law who loves experimenting in her kitchen like me. 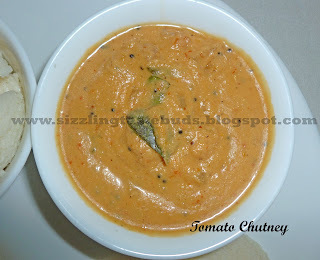 Tomato Chutney is prepared in different ways, so this is my first version of Tomato chutney. 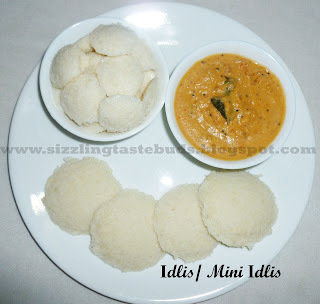 This tastes best with Idli's or Mini Idlis. (Click on the link to see the recipe. ). This chutney truely makes a wonderful dish to be sent in lunch boxes. With the heat rising in this summer, I heat the chutney and put in my husband's lunch box so that it doesnot get spoiled. So here's the secret of chutney's not getting spoilt for a day. Now here's the Tomato chutney recipe. Urad Dal - 1 tsp (optional). I just love its flavour in chutney. 1. Blend coconut, red chillies, roasted urad dal, garlic cloves and ginger piece in a blender to make it a smooth paste. 2. Heat 2 tsp oil in a kadai and add mustard seeds. Allow it to crackle. 3. Now add curry leaves and chopped onions. Fry till it turns translucent. 4. Add chopped tomatoes and fry it till tomatoes becomes soft. 5. Now switch off the gas and mix the coconut paste to this with some salt to taste. 6. Tangy Tomato chutney is ready to serve. Try this recipe and let me know how it tasted. I love chutney! I haven't tried the tomato variety yet so this recipe is definitely something I'll look into in the very near future. Thanks for sharing!